I am shocked by the internet hubbub today around Microsoft and SocialChorus. For those who aren’t familiar, apparently SocialChorus, in a bid to help Microsoft promote their new IE browser, contacted Michael Arrington of Techcrunch offering him compensation in exchange for writing a story about IE. This was either very smart or very stupid, and no one’s quite sure which yet. Arrington has frequently railed against the concept of “sponsored stories” and is vehemently against any form of brand-based compensation for the stories covered on Techcrunch. While the obvious response is to call SocialChorus stupid – how on earth would anyone in PR not know this – I have to question if it was all part of a plan. Because just look at the buzz Microsoft is getting as a result of this. But that’s another question for a different day. Sponsored Linking is Bad, mmm kay? At the root of this situation is a concept very irksome to me. SocialChorus was reportedly contacted by Matt Cutts about their strategy of getting bloggers to write about brands but not requiring nofollows on any related coverage. According to Google, if you are being compensated in any way for writing a story, you should use “nofollow” on any links to the site being covered. Not doing this runs afoul of their guidelines. Stay with me here, because this is ridiculous. If you reach out to a blogger and give them a free trial of your product, and they choose to write a story about how much they loved that product, they’re supposed to know to add a nofollow link to the link they place back to your site so that others can buy the product that they tried and loved. And if they disclose they received the product for free, but that the review is not influenced in any way? According to Google, that’s paid linking and it’s bad. So let’s get a little Marketing 101 here. Back in the days before Google, when you had a new product, did you just place it on a shelf and hope someone bought it? No. You paid for advertising (same as you do today), but you also sent samples of the product to people who would use it and asked them to try it out. They would tell their friends how much they loved it, and word would spread. Maybe a local news reporter would find some aspect of it interesting, and cover it on the local news. Maybe a radio personality would talk about how much they loved the product on the morning show. These are not paid endorsements, but because they got the product for free, Google would say they’re not valid endorsements. Fast forward to today. I’m part of a cool network called Influenster. They seek out people by way of surveys that are interested in certain things or share certain demographics, and send them free stuff. The users can earn points for more free stuff if they talk about the products on social media, share pictures, video, or write blog posts about them. The posts have to disclose that you received the product for free, and they have to be your honest opinion of the product. This is a legitimate form of marketing that has introduced me to cool new things that I might not have tried otherwise. For example, I have found that I love Belvita blueberry breakfast crackers. I love that I can toss them into my bag in the morning or before a long flight, and they give me an instant, hi fiber, low sugar meal when I’m stuck without one. Now, I’ve just shared that awesome experience with you. Yes, I got them for free, but now I actually go to the store and buy them. According to Google, I should nofollow that link (I didn’t). Do You Know What NoFollow Means? “This stuff”. So a legitimate company, focused on their business, not caring about how they’re perceived by Google (which incidentally is exactly what Google says they want), didn’t know anything about “this stuff.” Exactly. According to Google Webmaster Guidelines, “Another useful test is to ask, “Does this help my users? Would I do this if search engines didn’t exist?” Well no, Google, I wouldn’t use nofollow if you didn’t exist. Because it’s Marketing 101. Make cool stuff, get people to write about it and share it. 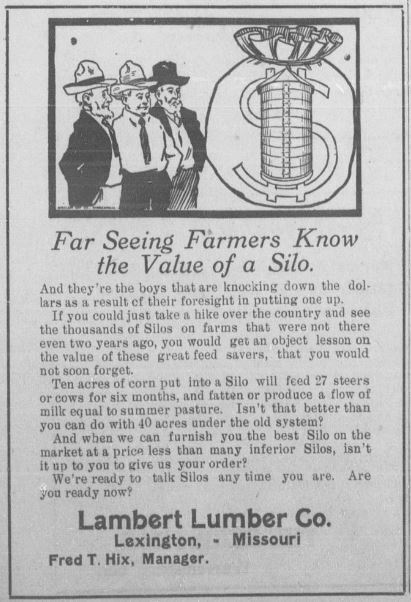 By Google’s paradigm, this ad from the 1914 Lexington intelligencier for Lambert Lumber Co. shouldn’t be archived and searchable in the Library of Congress. Do you agree? Should we hide all information just because it’s part of a paid opportunity? What if it’s the only place where I can learn that “ten acres of corn will feed 27 steers or cows for six months”? Do we really want an internet where the number one search engine turns a blind eye to anything that doesn’t “play by their rules”? Doesn’t that make a mockery of the free exchange of information they purport to support? Do I really need Google determining for me what is valuable and isn’t? Can’t I figure that out for myself? So I’m calling, begging, pleading to Google. Stop the war on links. It’s costing millions of dollars a year that could be better spent figuring out other signals to use to reduce spam. Go back to Marketing 101 and learn what it’s all about. Then figure out how to filter out what you don’t need or want in your search engine with clever algorithms, rather than punitive damages. Go back to being proactive, rather than reactive. And stop putting the onus on the millions of webmasters and legitimate business owners that don’t have a clue what “nofollow” is. Great Post Jenny. To me, the craziest thing about all this is that the onus is on the site blogging about the product, but Google penalizes the product owner. The product owner has no control over how the blogger codes their site! Really? Most webmasters and bloggers have no idea what a nofollow link is let alone how to implement the HTML markup for it. They probably don’t even know what HTML markup is or are even aware that Google has specific guidelines. Google expects waaaay to much from the average webmaster. For most SEO is boring technical jargon that is regulated to the tech department while social media is “cool.” Not always a good use of time or resources imo.